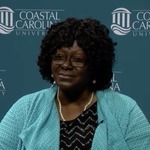 An actively involved Coastal student, Singleton-Young began (and ended) her 35+-year professional career at Coastal in a variety of student services areas, including Greek life, career services and financial aid. She was the first African-American Director of Student Activities (and later Multi-cultural Student Services) at Coastal. Beloved by students, her personal approach to caring for students gained her a lasting reputation for "Feeling the Teal". In 2019, a residence hall was named in her honor. Singleton-Young, Patricia and Tomczyk, Charmaine B., "Patricia Singleton-Young, oral history interview" (2016). The Coastal Carolina University Oral History Project. 7.